Get quick, safe, long-lasting relief from cramps, headache, backache due to functional menstrual distress with CHI-CHES-TERS. They act FAST. In clinical tests, noted physicians report 8 out of 10 women obtained marked relief—often after first dose. 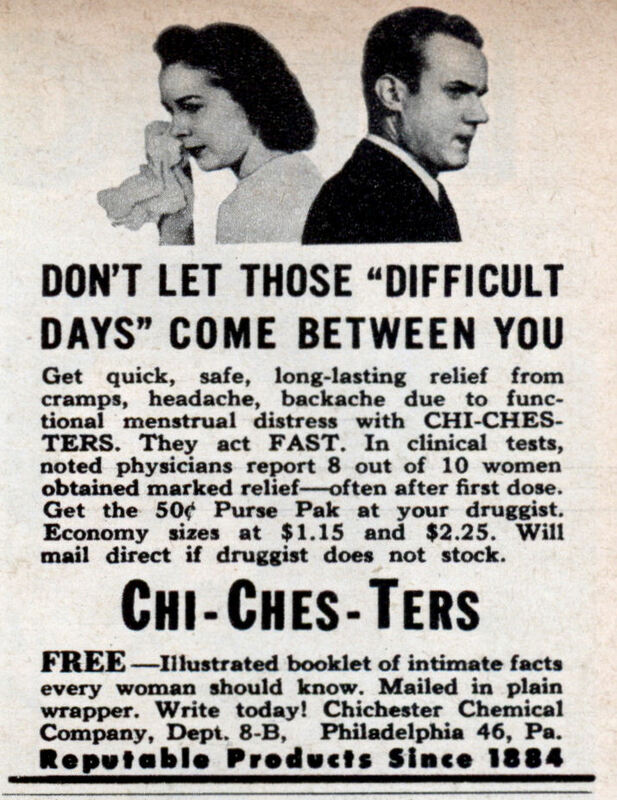 Get the 50c Purse Pak at your druggist. Economy sizes at $1.15 and $2.25. Will mail direct if druggist does not stock. FREE —Illustrated booklet of intimate facts every woman should know. Mailed in plain wrapper. Write today! Chichester Chemical Company, Dept. 8-B, Philadelphia 46, Pa.
There’s also a drug to help men with menstrual distress, its called whisky! These ones were PO-IS-ON, apparently, and were eventually banned. You’d be crying too if you were married to Richard Nixon. Even now the guy can’t catch a break.